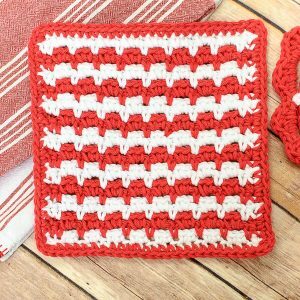 I have another kitchen crochet pattern for you today … This time a happy and colorful crochet dishcloth pattern. 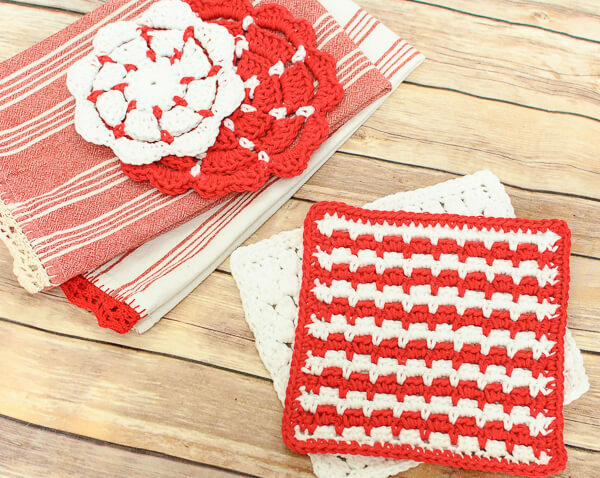 As you can see, I stayed with with red and white to coordinate with my crochet edged tea towels and crochet potholders. I am loving all the bright and cheery colors in my kitchen! Resources and tutorials you may find helpful in following this pattern: Crochet Abbreviations, U.S. to U.K. Crochet Conversion Chart, Crochet Stitch Chart Symbols. Row 1: Work 1 sc in 2nd ch from hook, *ch 1, skip next ch, 1 sc in each of the next 2 ch, rep from * across until 2 ch remain, ch 1, skip next ch, 1 sc in last, drop CA, turn — 18 sc and 9 ch-1 sps. Row 2: Join CB, ch 1 (does not count as st here or throughout), work 1 sc in first st, 1 sc in ch-1 sp, *ch 2, skip next 2 sts, 1 sc in ch-sp, rep from * across, 1 sc in last st, turn — 11 sc and 8 ch-2 sps. Row 3: Ch 1, work 1 sc in 1st st, ch 1, skip next st, *work 2 sc in ch-2 sp, ch 1, skip next st, rep from * across, work 1 sc in last st, drop CB, turn — 18 sc and 9 ch-1 sps. Row 4: Join CA ch 1 (does not count as st here or throughout), work 1 sc in first st, 1 sc in ch-1 sp, *ch 2, skip next 2 sts, 1 sc in ch-sp, rep from * across, 1 sc in last st, turn — 11 sc and 8 ch-2 sps. Row 5: Ch 1, work 1 sc in 1st st, ch 1, skip next st, *work 2 sc in ch-2 sp, ch 1, skip next st, rep from * across, work 1 sc in last st, drop CA, turn — 18 sc and 9 ch-1 sps. Rows 6 through 25: Repeat Rows 2 through 5. Fasten off CA. Edging: Pick up CB from side and ch 1, work 1 sc at the end of each row along side edge until corner, work 3 sc in corner, work 1 sc in each foundation ch across bottom edge, work 3 sc in corner, work 1 sc at the end of each row along other side edge until corner, work 3 sc in corner, work 1 sc in each st and ch across top, 3 sc in last corner, work 1 sc along edge of next row and join. Interested in making this project? this turned out really nice, Kara! That color is just so cheerful! Love it! reminds me of houndstooth. Do you know any patterns to make it more houndstooth looking? 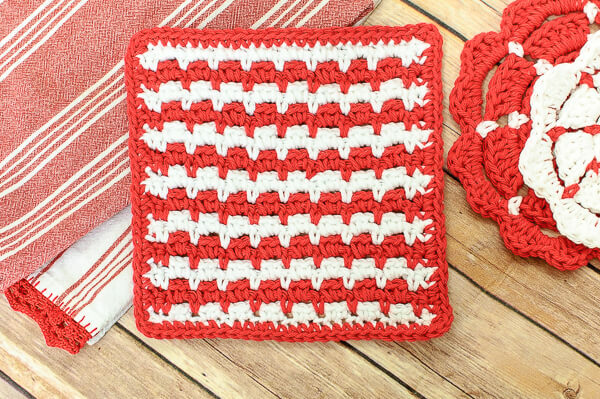 Very pretty 🙂 Thanks for the pattern. Have a great day!